Let’s test some of the newer masks from the Tonymoly I’m Real Mask Sheet line namely Pearl, Ginseng, Pumpkin, Orange and Olive. Here’s my review. 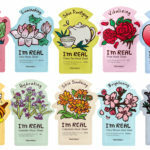 The Tonymoly I’m Real Mask Sheet line is one of the most popular sheet mask lines in Korea and in Europe. 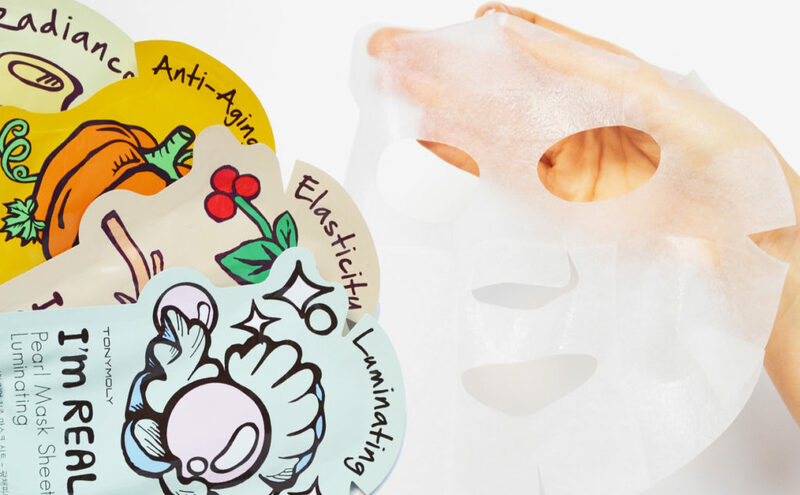 It comes in a whole range of exciting sheet masks targeting all kinds of needs and treatment areas. Tonymoly I’m Real Mask Sheet is a classic Korean sheet mask made of 3-layer of pulp sheet cotton-like material. The mask sits tight against the skin during the whole treatment period. 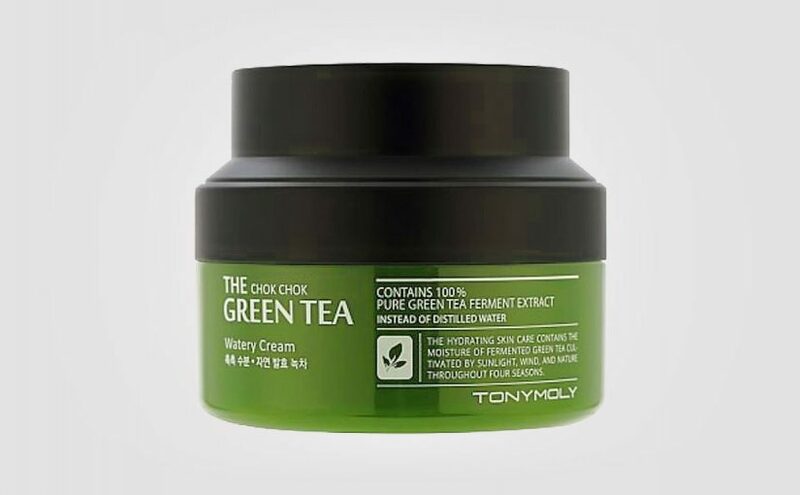 The Tonymoly I’m Real Mask Sheet line contains natural ingredients for deep hydration and nutrition. These sheet masks do not contain any parabens, talc, benzophenone or triethanolamine. 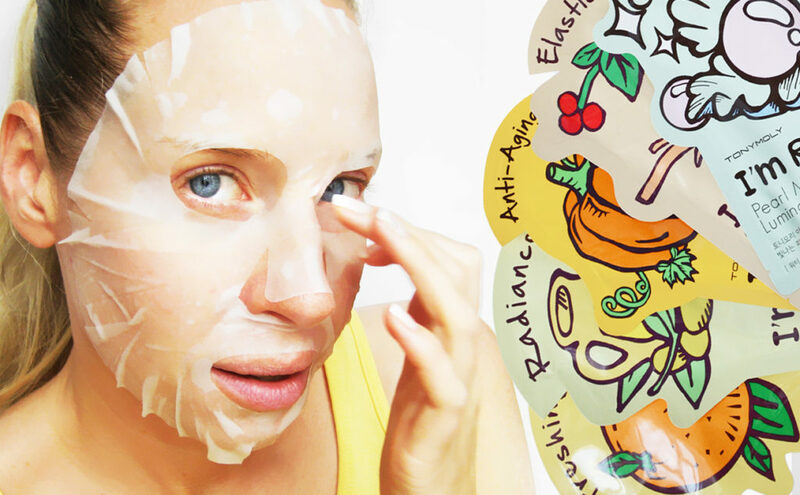 Apply the sheet mask to cleansed skin and allow it to sit for 20 minutes. Do not rinse your face after you’ve removed the mask. 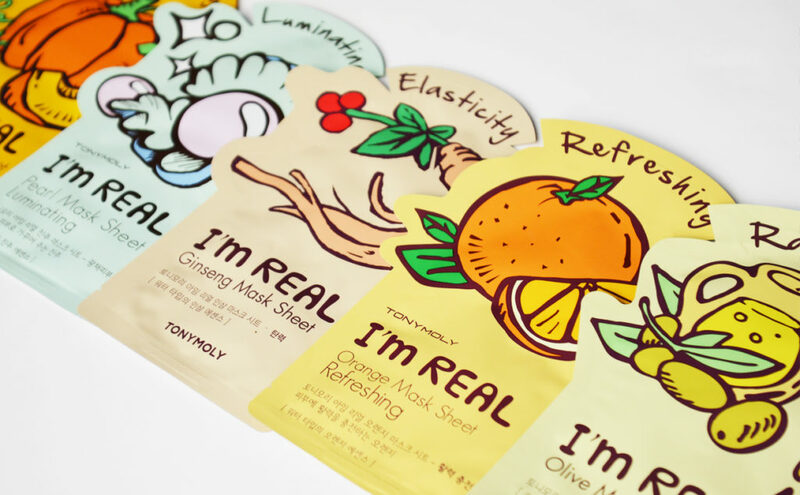 The Tonymoly I’m Real Mask Sheet line is incredibly popular in Korea and in Europe. It comes with a full range of best-selling sheet masks targeting all kinds of treatment areas. 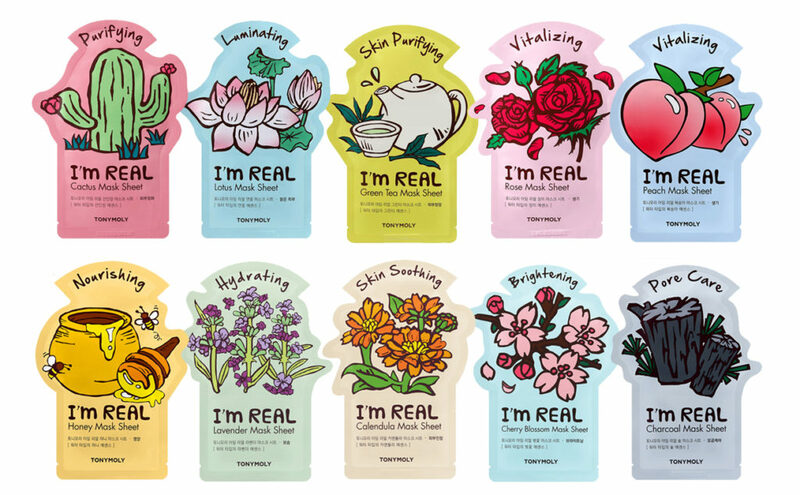 The Tonymoly I’m Real Mask Sheet line has something for each and every skin type. 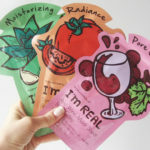 These sheet masks are incredibly colorful, fun and inviting. They are also very affordable and deeply hydrating for all skin types. However, I have noticed that there are small differences in feel and quality of these masks. So you do have to test them out for yourself to find your own favorites. Today I’m testing the newer kinds: pumpkin, pearl, ginseng, orange and olive. The Tonymoly I’m Real Mask Sheet is made of a thin cotton-like material. They are not too thin and not very thick either, but just like one would expect a classic Korean sheet mask to be. The sheet masks are folded and fully soaked in wonderfully fresh translucent thin essence inside the packaging. The masks are easy to unfold and handle, no problems there. OK fit, but some of these sheet masks feel a tiny bit “stiff” in the material. 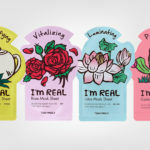 Overall, I feel that Tonymoly I’m Real Mask Sheet is a very nice line of sheet masks to try out, especially if you are new to Korean sheet masks. 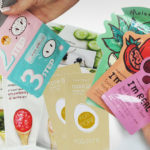 The Tonymoly I’m Real Mask Sheet line is a cheap and affordable line of deeply hydrating Korean sheet masks that are easy to use without any fuzz! I love that the Tonymoly I’m Real Mask Sheet line comes in such fun and colorful packaging. There are so many various ingredients targeting different treatment areas. I think this line includes over 25 different kinds of sheet masks. The fit of these sheet masks is quite OK even though the holes for the eyes are a bit off. 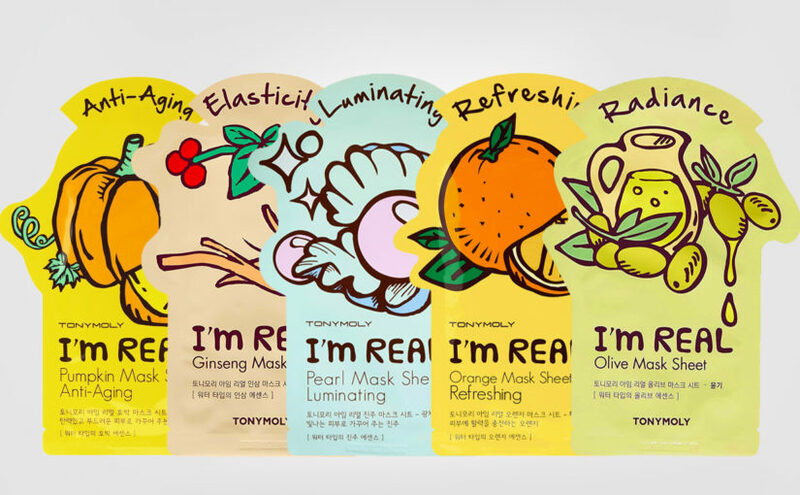 Given that the price is like 1€ /pc with free shipping from Korea when buying multi-packs, I absolutely think that the Tonymoly I’m Real Mask Sheet line is a really nice and affordable line. 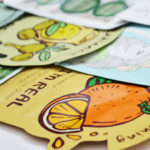 I mean, who can resist these fun and colorful sheet masks any way! The pearl mask contains, among other things, pearl extract and anise. This sheet mask provides bright, clear, fresh looking skin with a healthy glow. The essence is thin, light, translucent and fresh. The scent i similar to some mild detergent type product mixed with skin care and maybe some licorice? I think the material of this mask feels a tiny bit “stiff” and one have to press the mask in place a few times as it comes loose around the eyes and nose. Tonymoly I’m Real Pearl Luminating Mask Sheet feels incredibly cooling and refreshing on the skin. The cooling sensation lasts throughout the whole treatment period. Afterwards, the skin feels properly sticky when patting in the remaining essence. The skin looks fresh and clean with a healthy glow without being oily or greasy. Not the best sheet mask I’ve tested from this line unfortunately, but certainly approved by me! All skin types, even oily skin. The olive mask includes olive leaf extract, hyaluronic acid, bamboo and hydrolyzed collagen. The Sheet Mask is deeply hydrating the skin, smoothing out the skin and providing new radiance. The essence is light, thin and transparent. Very refreshing feeling on the skin I have to say. The olive mask have a green “clean” type of scent, but not a typical olive scent in my opinion. 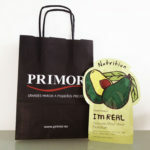 I had expected the mask to be more “oily” or thick, but it’s really light and super-fresh. The olive sheet mask feels incredibly refreshing and deeply hydrating the skin. It’s cooling and relaxing the skin throughout the whole treatment period. Somewhat sticky feeling when patting in the remaining essence, but not too bad at all. The skin feels incredibly fresh but without being greasy or shiny. Awesome! All skin types from normal to dry, combination and oily skin. Wow, I just love the scent of the orange mask. Super fresh and a lovely sheet mask that is really cooling and refreshing, just as promised. The essence is thin and translucent. I think of wet wipes, summer, drinks and cooling swims in the pool with a fresh hint of citrus. A really refreshing and lovely sheet mask and highly recommended by me for all skin types. From normal to combination skin and oily skin. And above all, perfect for tired dull skin in need of a fresh pick me up bringing new life and radiance to the skin. OK fit but the material is slightly “stiff” and could have been a tiny bit softer and smoother. Overall an awesome, wonderful and incredibly affordable sheet mask in my opinion. Really sticky feeling when all the essence has been absorbed. The skin feels cooled, hydrated and fresh with a healthy glow, but without being greasy or shiny. Orange is one of my personal favorites from the Tonymoly I’m Real Mask Sheet line, much because of the refreshing scent. The ginseng mask has a rather weak but fresh scent to it. I had expected a distinct “woody” type scent of ginseng but the scent is very mild. The essence is transparent and light. Lovely! Incredibly comfortable, de-stressing, cooling, relaxing and deeply hydrating the skin. If you dislike strong scents in skin care, then the ginseng sheet mask is a good choice from this line I feel. Some of the other sheet masks has a stronger scent than this one. OK fit. Sticky feeling when the essence is absorbed by the skin. I really like how my skin looks after using this ginseng sheet mask. My skin is soft and smooth with new improved radiance. I feel moisturized, but without the skin feeling excessively shiny or greasy (but as said sticky). I like this one very much! Thumbs up from me even though I had preferred a nicer scent. 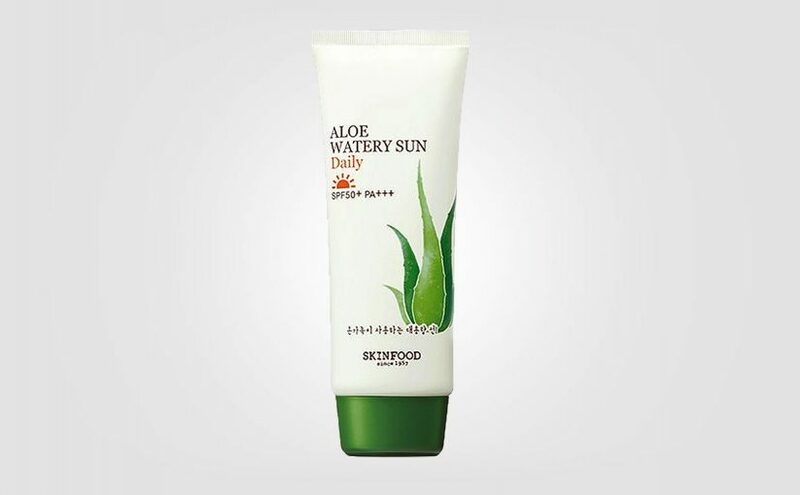 Suitable mainly for dry and mature skin types, normal to combination skin. This sheet mask has a mild and fresh pumpkin scent to it. Lovely light and thin translucent essence. 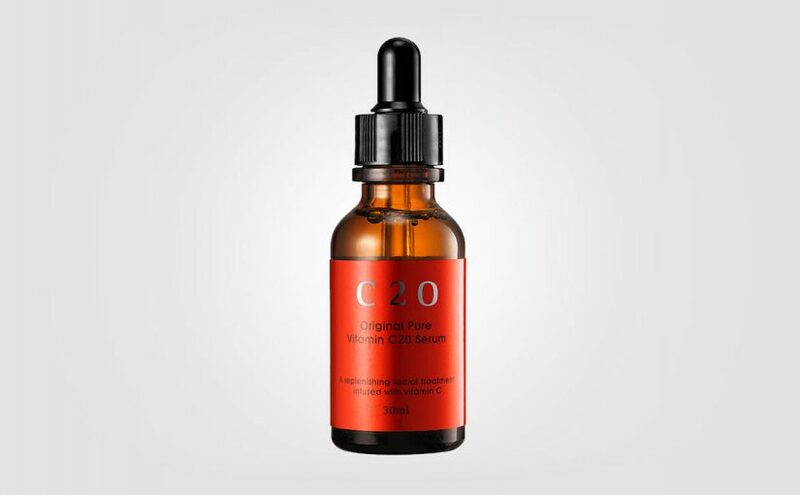 1000ppm pumpkin extract providing an anti-age effect to prevent signs of aging and fine lines. The cooling and refreshing feeling stays throughout the whole treatment period. A super fresh sheet mask in my opinion! When all the essence is absorbed, the skin feels very sticky. The skin is also properly moisturized and fresh looking with a healthy glow. My dryness and fine lines around the eyes are less prominent and the skin feels smooth and elastic, and perhaps even slightly firmer? Suitable for all skin types I think, but especially good for dry and mature skin as this sheet mask is deeply moisturizing, nourishing and has that anti-aging effect. I really liked the results on my skin. Also suitable for normal and combination skin types, but might be too much for really oily skin as you do feel properly moisturized after application. A really nice Korean sheet mask that does the job! Nice results and highly recommended by me. 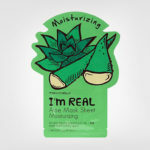 I recommend the Tonymoly I’m Real Mask Sheet line to most skin types. These masks are cheap, colorful and they do the job! 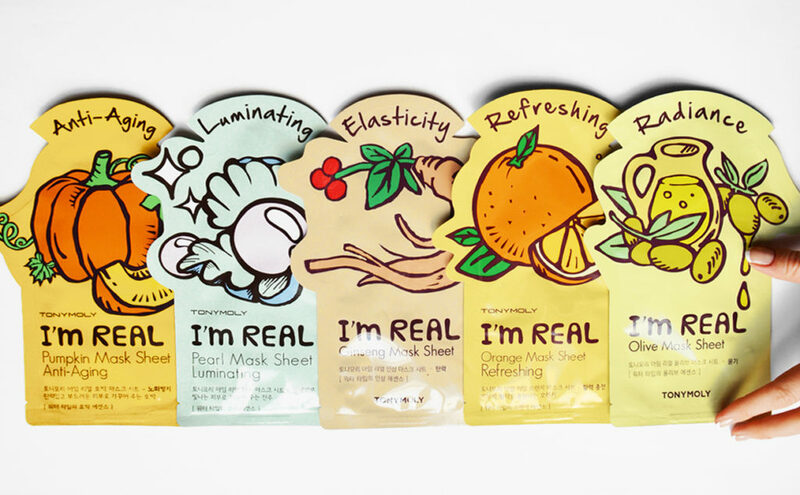 I would actually recommend the Tonymoly I’m Real Mask Sheet line to all skin types. From dry and mature skin, to combination and oily skin types. Particularly good for normal, combination and oily skin I feel, since all these sheet masks are very fresh and have a light fluid thin essence. If you have dry skin then don’t exceed the recommended treatment time of 20 minutes, because the sheet masks might start to dry slightly after that. Plus for the incredibly colorful and inviting packaging. Plus because this line offers a whole range of ingredients and different treatment areas. Plus for the hydrating, cooling and refreshing feeling on the skin during treatment period. Big plus for the price, which is often from about 1€/pc or even cheaper when buying multi packs. Plus because these sheet masks doesn’t smell of alcohol. A little minus for the fit and that the sheet masks might loosen slightly around the nose and the eyes. The holes for the eyes feel a little bit off. Some of the masks could have been slightly softer and more flexible in the material providing a better adherence. 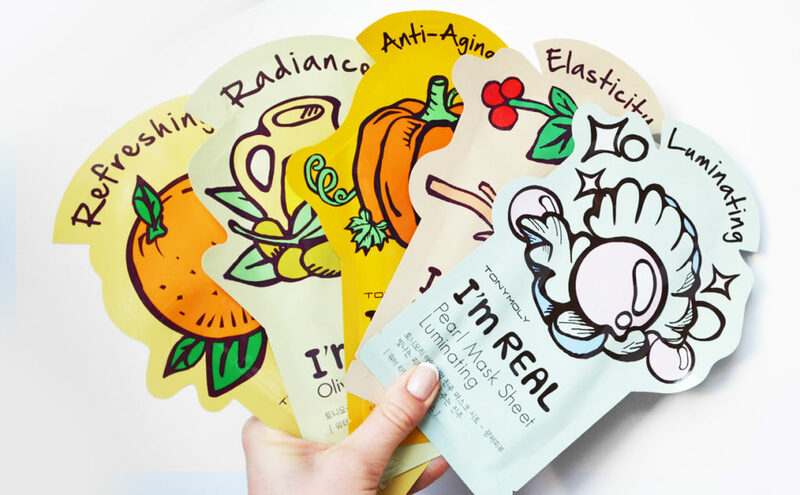 Overall, the Tonymoly I’m Real Mask Sheet line consists of really fun and colorful sheet masks you can apply whenever the skin needs that extra care. Very nice indeed! 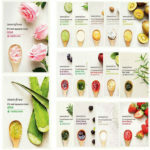 In the image above some of the newer sheet masks of 2018. 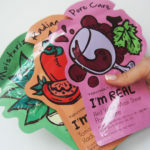 The Tonymoly I’m Real Mask Sheet line is a really nice line of Korean sheet masks that are easy to use without hassle. They are deeply hydrating the skin and suitable for most skin types. In addition, they are colorful and fun as gifts. This sheet mask line is absolutely recommended by me, especially due to the very affordable price. 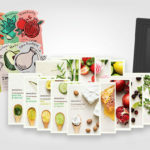 Formula: Tonymoly I’m Real Mask Sheet line contains natural ingredients and all sheet masks are cooling and deeply hydrating. 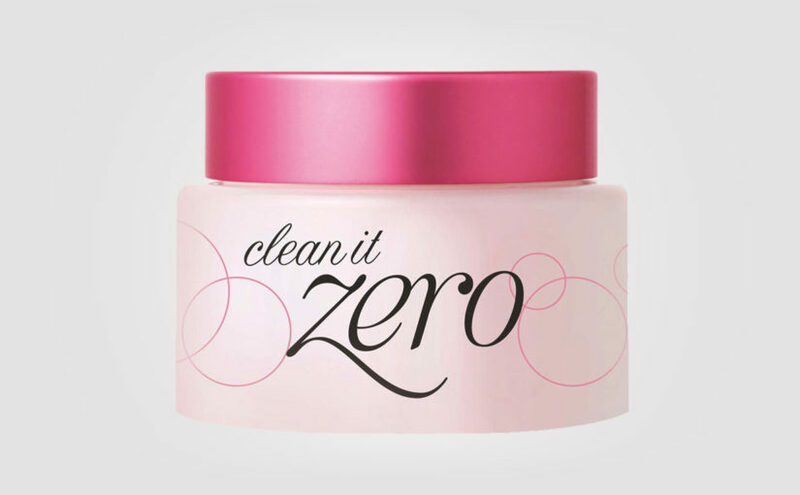 The masks are free from parabens, talc, benzophenone and triethanolamine.